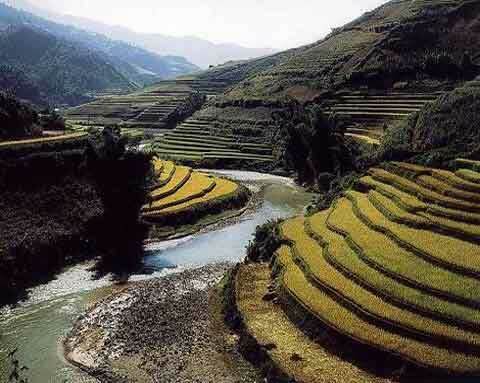 VietNamNet Bridge – The stone church and Muong Hoa Valley in Sapa tourist town, the northern mountainous province of Lao Cai, have been submitted to the Vietnam Record Organisation (VietKing) to seek recognition as Vietnam’s records. Accordingly, the stone church has been nominated as one of the five best-known over 100-year-old churches and the valley, one of the five most beautiful and largest valleys in the country. According to the Top Vietnam book’s proposal posted on VietKing’s website, kyluc.vn, the stone church was built in the early 20 th century on an area of 6,000sq.m with Roman Gothic architectural style, which is clearly seen in its pyramid-shaped roof, bell tower and dome. Situated in the centre of the resort town, the church has a 20m bell tower with a 500-kg bell. The four other nominated churches are the Hanoi Cathedral, built in 1887, Phu Nhai Church in Nam Dinh northern province (1886), Phat Diem Church in Ninh Binh northern province (1875-1899) and the Notre Dame Cathedral in Ho Chi Minh City (1863-1865). Meanwhile, the Muong Hoa Valley, home to many ethnic minorities, has beautiful terraced fields. In particular, hundreds of stones of all sizes with unique carving patterns are found here, which draw the interests of both domestic and foreign researchers. Together with Muong Hoa Valley, Muong Thanh (in Dien Bien Province), A Sao (in Thua Thien - Hue Province), Mai Chau (in Hoa Binh Province), and Love (in Da Lat City, Lam Dong Province) have been nominated as the five most beautiful and largest valleys in Vietnam.